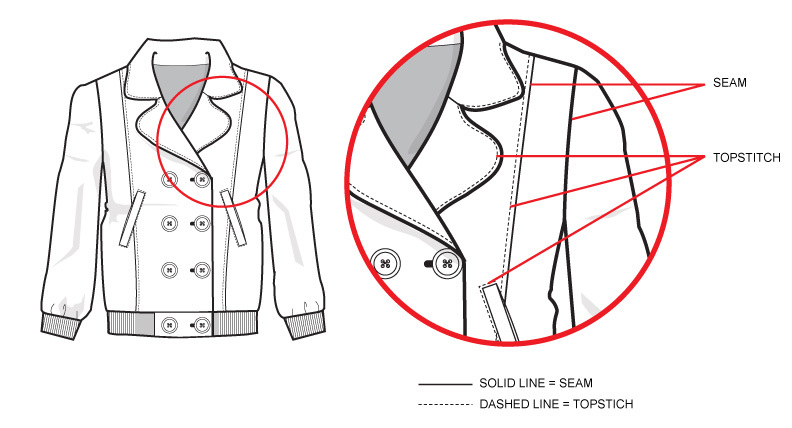 When drawing your garment flats, its always important to indicate every seam and every topstitch so that your sketch can be interpreted correctly by your pattern maker, sample maker, factory or anyone else who has to “read” your sketch. A solid line on a sketch indicates a seam. A dashed line indicates a topstitch. Do you need to draw the side seams? Since we typically draw only the front and back of our garments – it is generally understood that there is a side seam and for pants that there is also an inseam. If you have a side seam that has a special detail or construction, then it could be a good idea to draw a side view of your garment.